Beginning in the Fall of 1971, activists more closely involved in community issues took over the responsibilities of publishing the Rag. 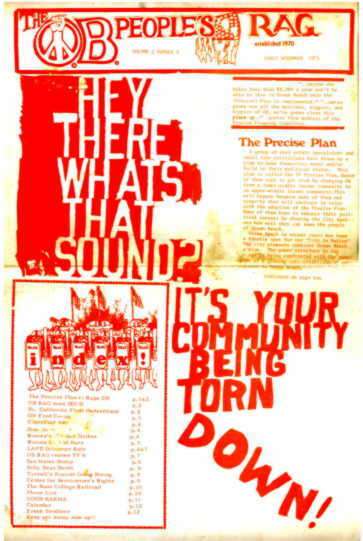 Ocean Beach, as a community was being threatened with redevelopment and organizers saw the Rag as a grassroots resource. Developers and the City were making noises about redeveloping OB’s waterfront through an urban design for the community, the Precise Plan. 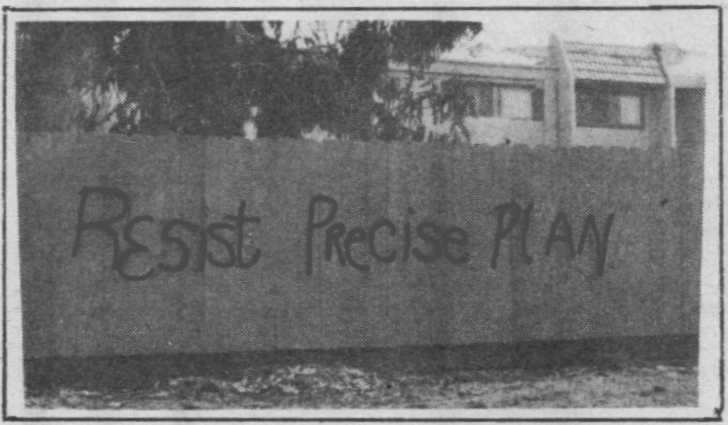 Locals who were outraged by this plan, joined with others who wanted to start a neighborhood “free school”, to reformulate the Rag – for the first time it was published in a newspaper format – and began using it to create alternatives to mainstream institutions. 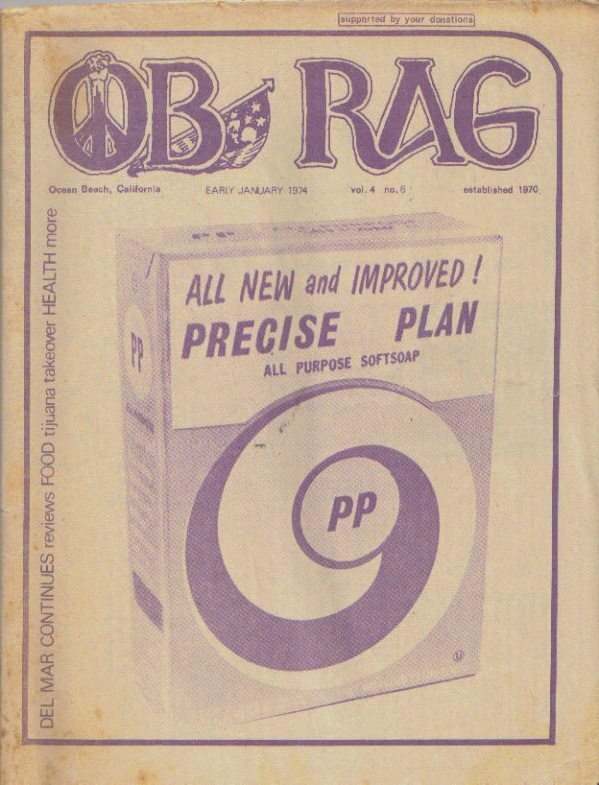 For the very first issue of its second year, the Rag moved into what the staff called “the big-time world of full sized newspapers.” It was being printed on tabloid sized paper. At long last, the Rag LOOKED like a newspaper. It still appeared rough and crude, paste-up jobs evidently done in the middle of the night, the staff box had been omitted on the first issues. But it was printed on quality paper – not newsprint, three columns to a page. Twelve pages. Lots of graphics, with the back page devoted to important phone numbers and “The Fabulous Furry Freak Brothers” cartoon. Right during this transition, almost as if it was one last flash at being “revolutionary” – the first issue of the new publishing year, the September 5 – 19, 1971, was devoted to George Jackson, a militant Black Power prison inmate who had just been killed in late August apparently under very suspicious circumstances. The cover had his photos and an article – from some other publication -written by Angela Davis. Will the “Connie” Sail to Vietnam? The issue known as the George Jackson issue also contained a lengthy two-page spread on whether the USS Constellation (“the Connie”) was going to sail off to Vietnam. There had been a concerted campaign by local anti-war activists aligned with two Bay Area groups to stage a public vote on whether the carrier should sail off in October 1971 to war. Called the Harbor Project, the non-violent campaign was a year plus effort to raise consciousness about the Vietnam war by organizing a vote during the week of September 14 through 21 – a vote that included both sailors and civilians – on whether the Connie should sail as scheduled. Approximately 500 people ended up voting. On Friday, September 3 , we made our first run to the North County. Everyone involved is putting in two dollars, and with that money we should be able to get all of the fruit, vegetables, eggs, bread, and honey that we need to live on for one week. The was also an article about the OB Community School “starting to come together”, announcing a October 4th opening, and calling for donations of paint, pencils, crayons, etc. But outside the OB Flashes, there was no real community news. This was all to change. Never again would a front page cover article be a reprint from some other publication. Significantly, however, beginning with the early November issue, the OB Rag charged headlong into the despised Precise Plan, taking it and its sponsors, Peninsulas, Inc., to task for pushing an elitist, anti-poor plan for gentrification. It was class warfare and the Rag was leading the counter-charge. It was the early years of the seventies, and the Rag promoted the first rumblings of a grass-roots counter to the establishment’s resort plans that was then taking shape. These rumblings would later morph into the Ocean Beach Community Planning Group two years later – the forerunner to OB’s current Planning Board. The Doyles and Kozden were involved in these early days of organizing a grassroots answer to the developers. That same orange issue also included a lengthy article and update about the OB Food Co-op. The Co-op was then into its third month and had grown from an initial membership of 15 to about one hundred. Having begun an organic food co-op, they used a backyard shed to house the do-it-yourself bulk scales, beans, rice, fruit and veggies. At that point, the Co-op had worked out a system where OB was divided up into four areas, and each week a different area was responsible for collecting the orders from the members within that area. This backyard co-op would later evolve into the People’s Food Co-op, opening up in August 1972 an actual store front on Voltaire Street, run totally by volunteers. Eventually, this store front later moved down the street and over the years, “People’s”- the organic food store – became OB’s largest employer, hiring over one hundred people. Alongside these efforts, the OB Community Free School opened, staffed by a combination of community people, parents, and new teachers. Centered in an old house on Voltaire Street, the school gave dozens of children an alternative education, where the community was the classroom. Kozden and Dennis Doyle, along with Diehl, were part of the first wave of the school’s teachers. Many of these folks later went on to teach in public schools and some became principals and superintendents. The Rag complemented and in turn strengthened these efforts to develop alternative institutions, widening the outreach of ideas and new concepts to more and more readers of the paper, as the circulation increased into the thousands. During this phase of the paper, the staff was eventually able to connect the two currents of the information provided in its pages: community news – from a progressive perspective, and left-wing political issues. With women staffers taking on more and more responsibilities, there was the beginning of an indigenous feminist slant on the paper, not fully developed for a while, but already evident in plain view.